Adventure climbing at its best, a hair-raising scramble from the Bench Lakes leads to a fun, 2-pitch 5.4 chimney with breathtaking 360 degree views. Mt. 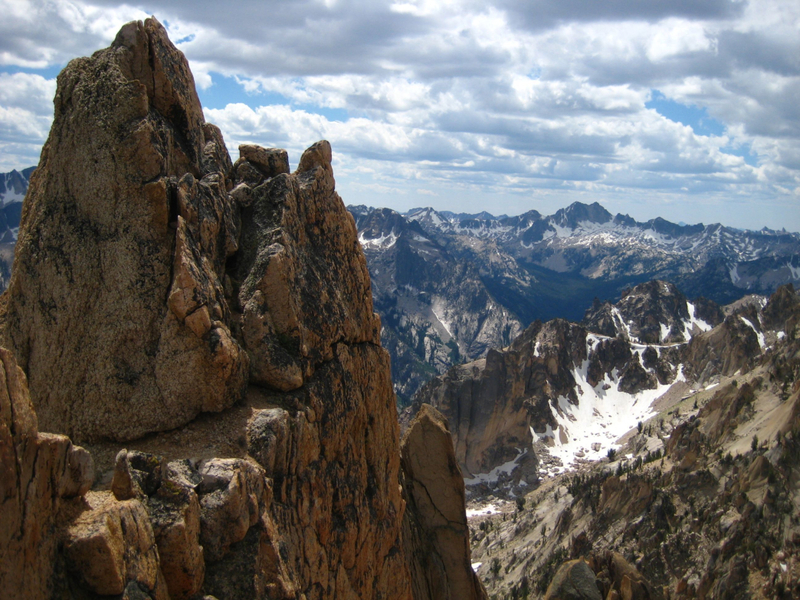 Heyburn, 10,229’, is one of the most obvious peaks in the Sawtooth Range, with what appear to be 3 summits. Mostly made of rotten granite, Louis Stur found a solid chimney on the west face and along with Jerry Fuller and Jim Ball made the first ascent in the late 1950’s. Watch carefully and you may see some of their original gear that can still be found on the route. The challenging approach is very alpine and feels very remote. 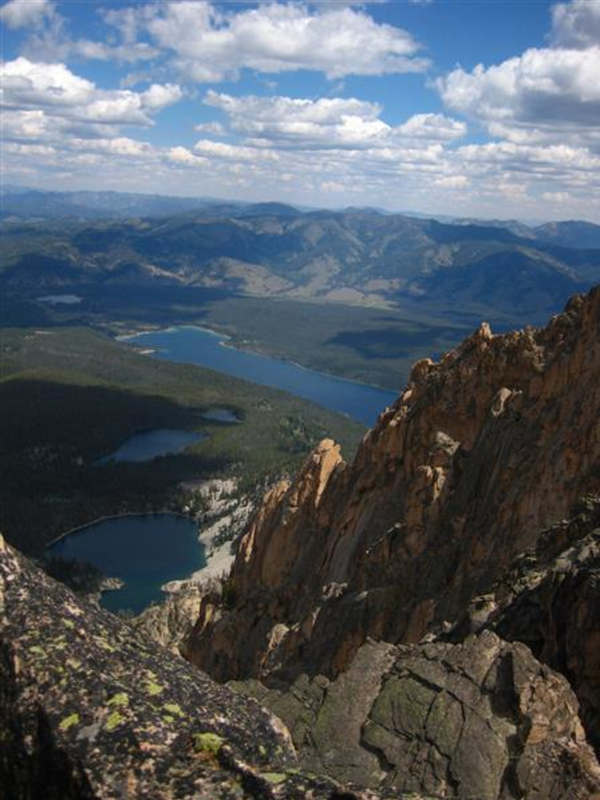 The approach and climb can be completed car-to-car in one very long day from the backpackers’ trailhead at the northeast end of Redfish Lake. Or, hike in the day before, camp a the lower Bench Lake, and finish the approach, climb and hike-out on the second day for a more leisurely pace. 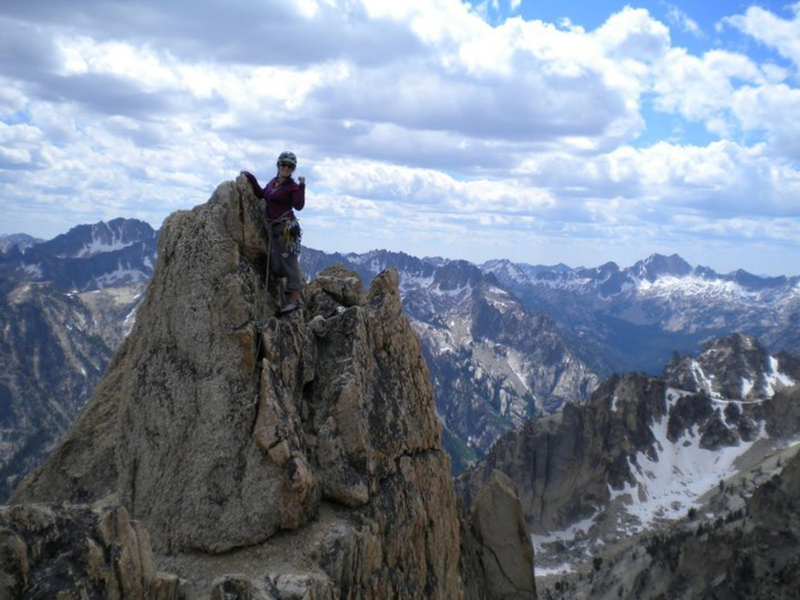 To make the approach, climb up and around the north side of Heyburn from the Bench Lakes through “ball baring” scree and VW Bug-sized boulders to reach a low saddle. Continue around reaching the chimney on the west face. Once you’re at the base of the chimney, the climbing itself is fairly moderate. Depending on who is asked, the grade ranges from 5.2 to 5.7, though we feel it's a moderate 5.4. The chimney offers solid placements for gear and with a 70m rope, can nearly be completed in one long push, though it is more comfortable to break it into two. The pull up and over the large chockstone is a bit unnerving as is climbing through some loose rock with loose gritty holds. Overall though, the climbing is straightforward. At the top, its no understatement to say your mind may be blown. Incredible views of ridges undulated in every direction stretch to the north, south and west of the range. The Boulder White Clouds peak out across the valley. The bright blue sky and clouds create a dance of shadow and light that illuminates every nook, hook, cut and ripple across the many faces of peaks that spread into the far distance around you. 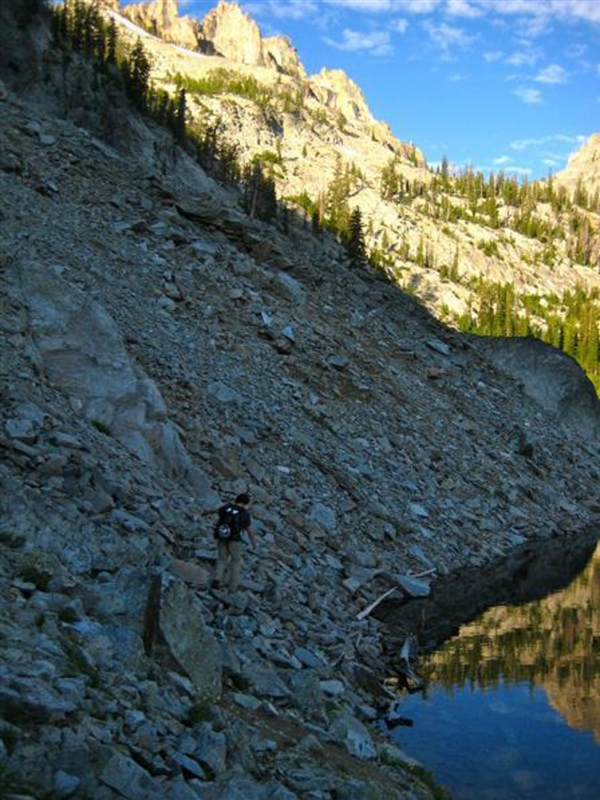 Redfish, the Bench and dozens of other small and large alpine lakes glitter below. This is one of those views that make time nearly stand still and that will be etched forever into your mind. 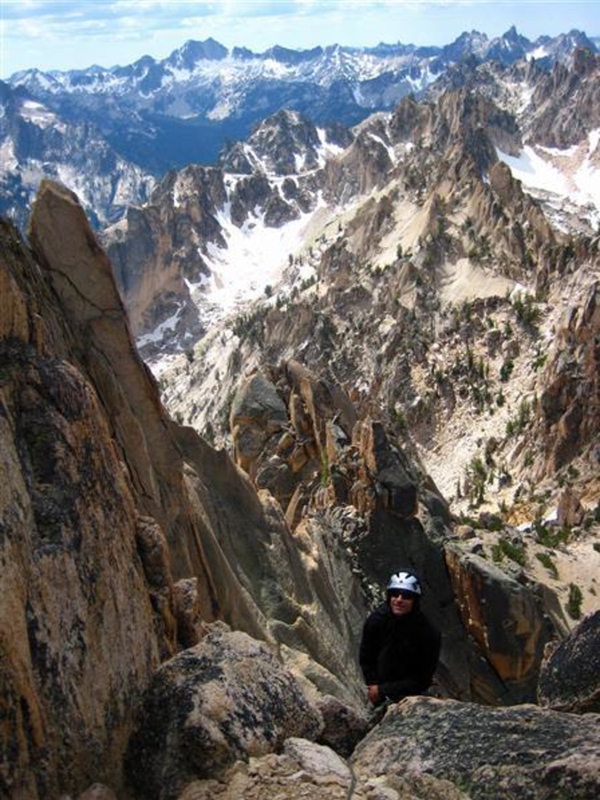 The obvious platform provides access to the narrow knife-edge step-across to the true summit and a great photo op. Sign the summit register and, looking over other recent or not so recent notes and marvel at how few people have made it to the top. Keep an eye out for the summit pig memorial left in honor of Carl Skoog by his brother Gordy Skoog in 2008. Depending on who is asked, the grade ranges from 5.2 to 5.7, though we feel it's a moderate 5.4, so if you feel comfortable in that range, this route is for you. 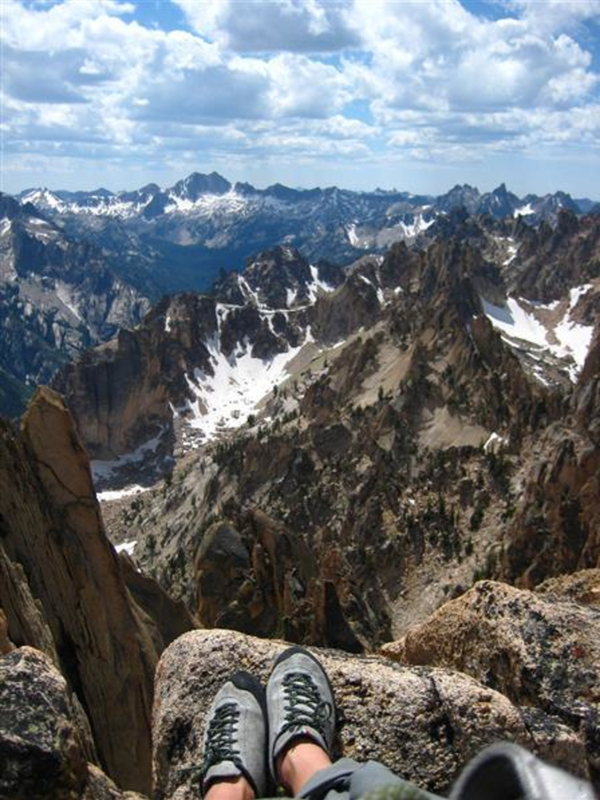 Look for Idaho: A Climbing Guide at Benchmark Adventures, Idaho Mountain Touring or borrow it through the AAC’s lending library.